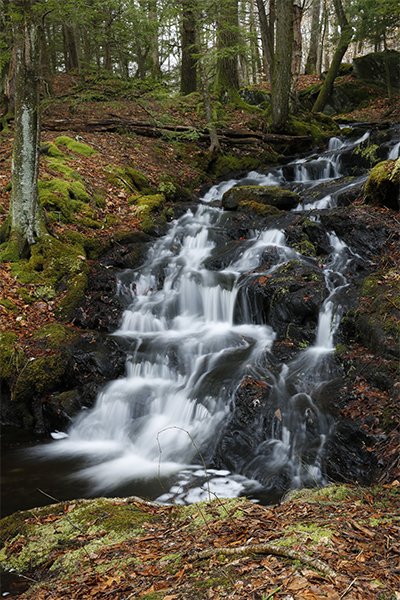 Some small waterfalls are glorious when there's enough waterflow to reveal their full potential. 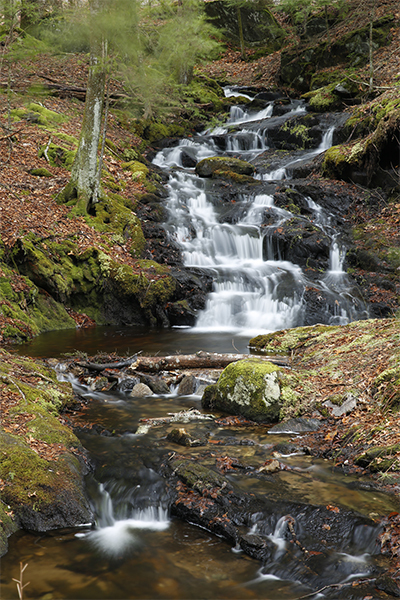 Flat Brook Falls is one example: visit at the right time, and you'll find a beautiful scene with an extremely photogenic, moss-surrounded falls. The falls have many small, almost staircase-like, drops throughout its formation, which lends to a lot of whitewater being produced. 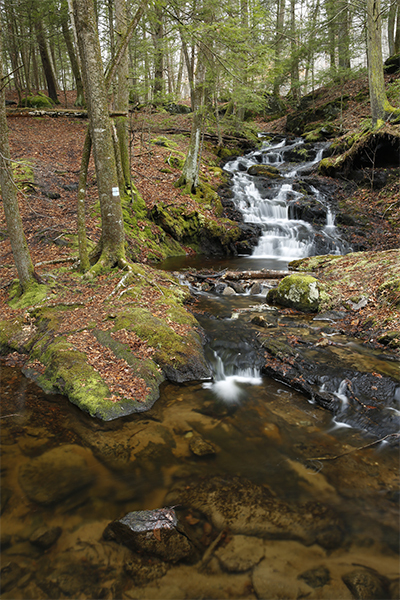 Just below the falls, the tributary dumps into Flat Brook. 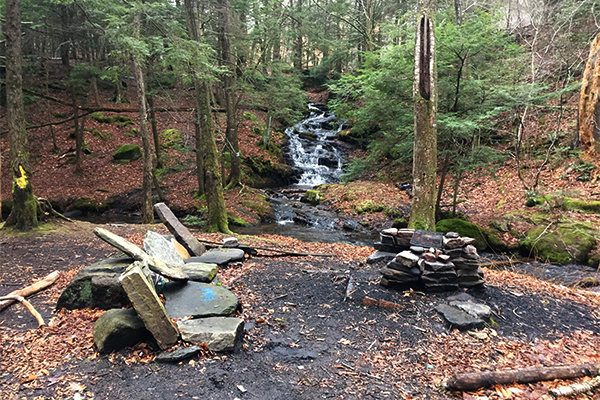 If you can find a way to safely cross Flat Brook, there's a set of stone seats that provide another vantage point of the pretty falls. You'll be following a portion of the blue-blazed, 46-mile long Shenipsit Trail most of the way to the falls. From the point where the trail crosses Imperial Dr, start your hike on the left hand (opposite) side of the road and start hiking downstream. In only a few feet, you should see a marshy area on your left, and soon after, a stream. After hiking downstream for 0.4 mile with the stream nearly always in view, cross a different seasonal stream. Continue straight 0.1 mile further and then take a left onto a white-and-blue blazed trail. Follow this trail for 0.1 mile and the falls will present themselves on your right as they dump nearly into the stream you've been following along for most of your hike. Take note that portions of this hike are on a narrow, ever-eroding, and potentially slippery slope. Take caution in these sections, especially when the trail is wet or icy. From Hartford, take CT 2 south to exit 8. Turn onto CT 94 east. Continue traveling on CT 94 east for 3.0 miles past the junction of CT 94 and CT 83 and take a right onto Marlborough Rd. Follow Marlborough Rd south for 0.7 mile and turn right onto Imperial Dr. Follow Imperial Dr for 0.2 mile and park on the side of the road near where the blue-blazed Shenipsit Trail crosses the road. If you don't feel comfortable parking here since it is a somewhat busy residential street, you can also park back at the beginning of Empress Rd, which you passed on your way in.